Cephalonia (Kefalonia) is a small island in the Ionian archipelago. Its verdant hills, eerie caves, stunning beaches and rich mythological resonances enchant visitors. Beaches top the list of things to see. Indeed, Cephalonia has some of the best shores in the country. Myrtos Beach is the most famous. Kaminia Beach is home to loggerhead turtles and is great for children. Antisamos Beach and the Blue Flag beach at Skala are also lovely and very popular. Most of Cephalonia's beaches are pebbled so beach shoes are a good investment. Cephalonia is also richly endowed with subterranean wonders. Melissani and Drogarati Caves are both exciting places to explore. Melissani's underground lake is strikingly beautiful, while Drogarati's enormous stalagmites and stalactites are a must-see. Cephalonia's hiking, horse riding and watersports scenes are good as well. Culture lovers should add St George's Castle to their itineraries. Located in Peratata, its breathtaking views and slightly eerie atmosphere are terrific. The Monastery of Agios Gerasimos is also worth seeing. Rebuilt by locals after an earthquake in 1953, it houses the remains of its holy namesake. The saint's coffin is opened weekly so that visitors can see the body and pay tribute. 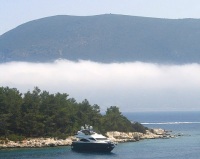 The small island of Ithaca is a popular excursion from Cephalonia. The location is famous as the setting for Homer's Odyssey, and for its scenic beauty.